Newton Faulkner and Amelia Lily star in the return of award-winning Green Day-inspired musical American Idiot, which crashes back into the Arts Theatre for a limited run. Arriving in the West End following a hugely successful UK tour, the smash-hit rock musical is set to entertain London from July 8th to September 25th, with press night on July 13th 2016. A Grammy and Tony Award-winning musical, American Idiot is the story of three childhood friends, each searching for meaning in a post 9/11 world. Including multiple hit Green Day anthems by Billie Joe Armstrong and a book by Armstrong and Michael Mayer, the musical features well-known songs such as “Boulevard of Broken Dreams”, “21 Guns”, “Wake Me Up When September Ends”, “Holiday” and, of course, “American Idiot”. Additional songs include unreleased tracks from the band such as “When It’s Time”. Double platinum album artist Newton Faulker stars as Johnny, opposite X Factor finalist Amelia Lily, who has been wowing critics with her strong performance as Whatsername. Additional cast members include Cellen Chugg Jones as Theo, Jemma Geanaus as Alysha, Alexis Gerred as Tunny, Llandyll Gove as Gerard, Karina Hind as Libby, Emma Housley as Heather, Lucas Rush as St Jimmy, Steve Rushton as Will, Alice Stokoe as Extraordinary Girl and Lawrence Libor. American Idiot’s creative team features design by Sara Perks, sound design by Chris Whybrow and lighting design by Tim Deiling. 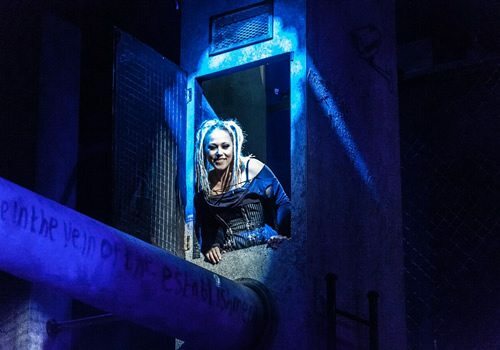 Directed and choreographed by Racky Plews, who was nominated for Best Director and Best Choreographer in the WhatsOnStage Awards, American Idiot is previous winner of Best New Musical in the Broadway World Awards. Further awards have included the Grammy for Best Musical Theatre Album and Tony Awards for Best Scenic Design and Best Lighting Design. A rockin’ new musical that has enjoyed extensive runs across the UK, don’t miss out on reliving your youth with American Idiot at London’s Arts Theatre from July 8th 2016. Containing mild adult themes and strong language, American Idiot is recommended for ages 14 and up.